Over the Easter weekend (end of March, beginning of April, 2013) my family was in Little Rock. 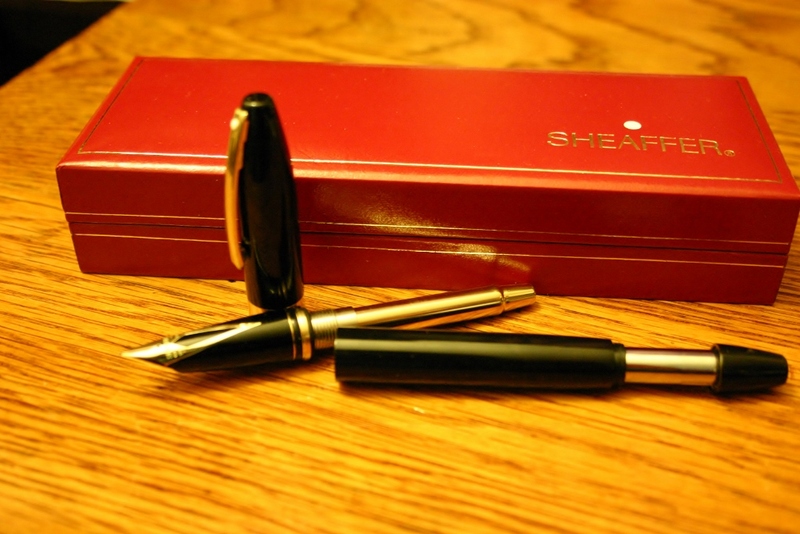 I have a habit of visiting several places... not least of all, Vanness Pens. As much as I would like to make a plug for them, the reality is, they still exist because they do what they do so well, and their work speaks for itself. 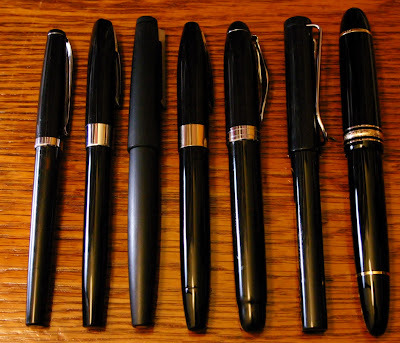 Needless to say, there are a handful of pens that I have bought online, but I generally try out the more expensive ones... you never know... there are always little differences even within the same make and model. 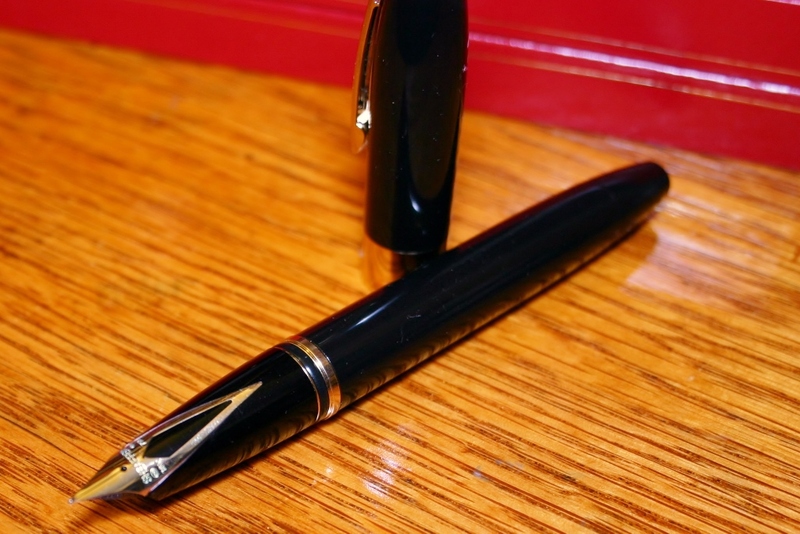 I went in with some intention of test driving a sailor pen, trying to talk myself into a Parker Vanishing Point, pondering the Faber-Castell basic, I even thought about the Waterman Exception. I loved the nibs on the Sailors, not sure about the body... still can't get over the clip placement on the Vanishing Point... the Basic did not sit right with me... and I am still fascinated by the Waterman Exception. Eventually, I made it to the Sheaffer case. 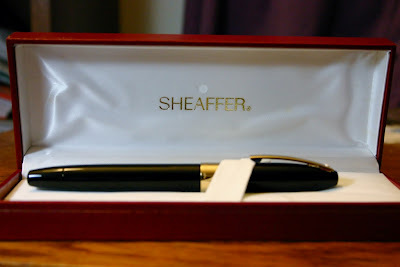 I had made an offhand comment to Mike Vanness several months ago about my perceived decline in the quality of Sheaffer products, he told me I shouldn't give up too easily on them, they still had several great products. 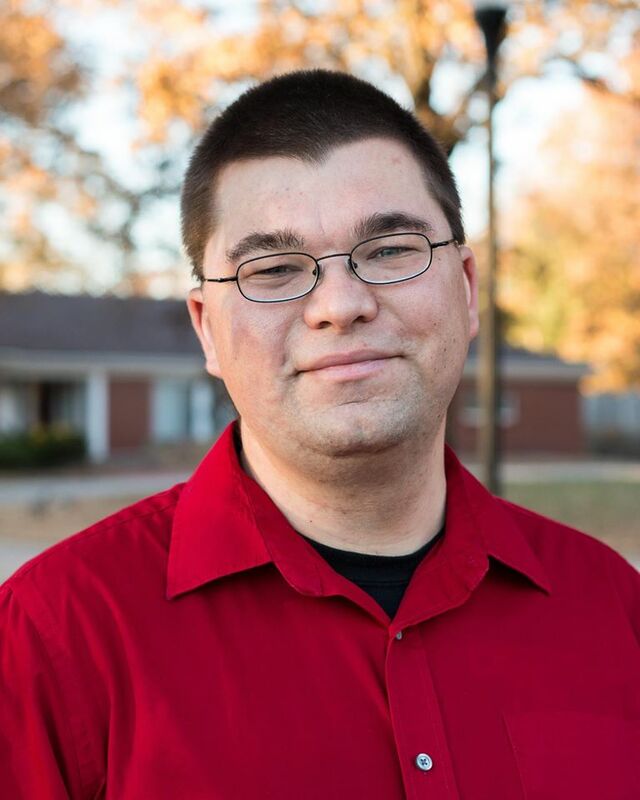 Several months ago I tried a Legacy and I wasn't sure. 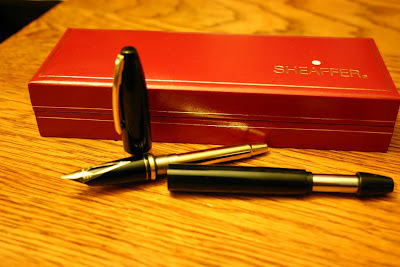 I liked how it felt, I liked the nib... but I couldn't get over the "modern Sheaffer" hang up. So THIS trip, after trying it once before, after writing with a MB 149 for several months... when Mike took the Legacy 2 out of the case... it didn't take much convincing. I haven't looked back. I got the black lacquer with gold trim. I have wondered if I should have gotten one with a silver cap... but when I see pictures of them all together, my eyes are always drawn to this one. It is a hefty pen. Lite pens make my hand cramp. It is not in any way unbalanced. I am not in the habit of posting my caps, but I could if I wanted to, and it would not make the pen unwieldy. I love the inlaid nib. I went for a medium, and I would say it is fairly true to that. The section is also very nice. 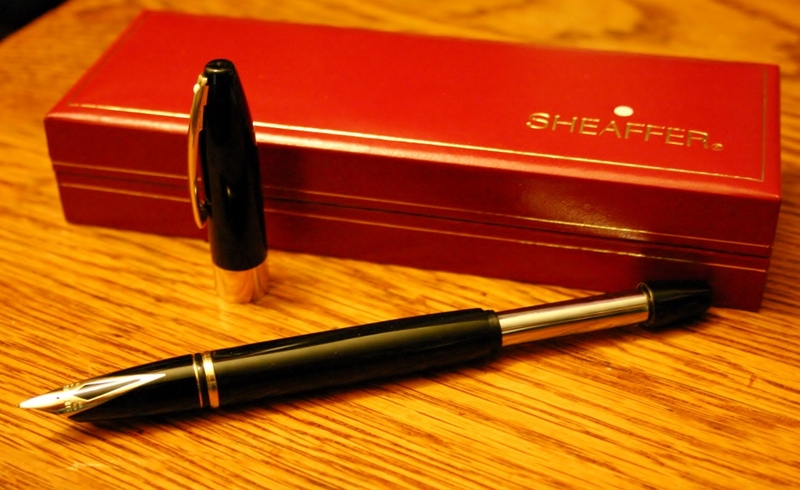 I would say it has a very similar girth to a Lamy 2000, but it barely tapers. The cap is held in place by an O-ring on this model. I have tried several hand holds, and they are all comfortable. I wrote lesson plans and lecture notes with it and did not have any problems with fingers slipping on the lacquer or finding any annoying bumps, threads, etc. In my ignorance, I had glossed over the filling mechanism until after I bought it. I know the pen is a reincarnation of the PFM (Pen for Men) and I am aware of the touchdown filling system... but it really is a treat. It really works well. I also like the idea that I can swap out the touchdown adapter with a cartridge. I don't think I have used a cartridge in close to 15 years... but the adaptability is nice. 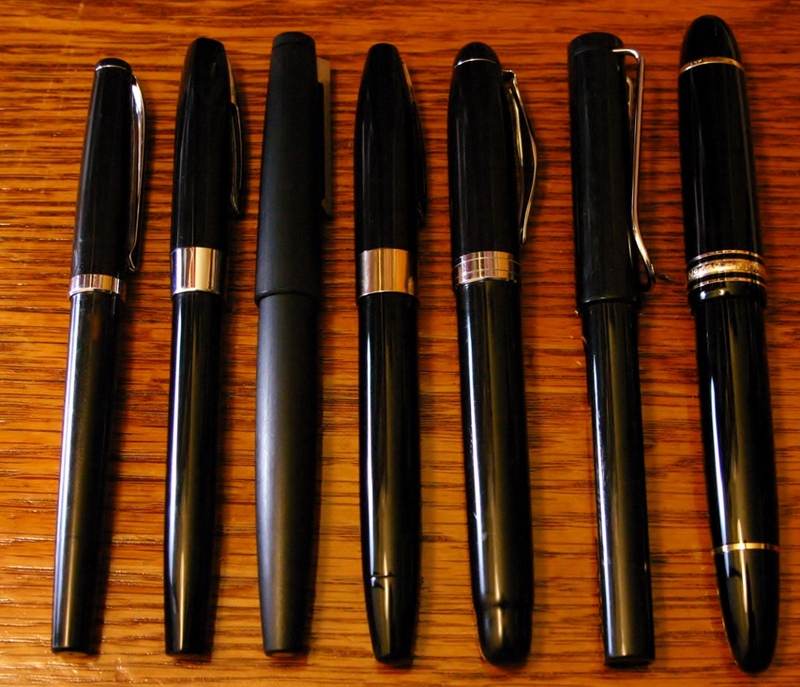 Comparing it to other pens... from left to right: Noodler's Nib Creeper, Sheaffer 330, Lamy 2000, Sheaffer Legacy 2, Noodler's Ahab, Lamy Safari, MontBlanc 149. I thought about throwing a few others in there... but I had a black pen theme going... so I stuck with it.